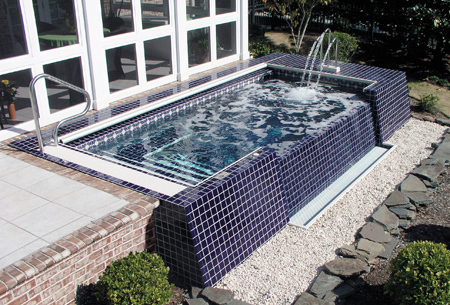 A RibbonFlo© Swimspa by Bradford is not only going to make your home more beautiful, it will make it more functional too. 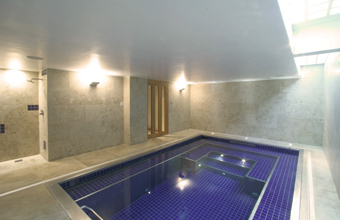 All the benefits of a modern Hydro- Therapy vessel combined with the features you love. 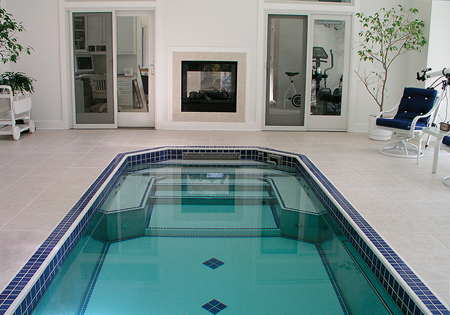 Treat yourself to a complete workout or simply relax and let the warm water just carry you away. The RibbonFlo© design creates one of the most uniform currents on the market while maintaining an almost undisturbed water surface and totally eliminates "water slamming". RibbonFlo© as the name suggests, is just that. One layer of directional focused water stacked on top of a second layer of focused water that produces a generated captive current. Because we don't use air injection systems we have eliminated surface turbulence and the need to fight through buoyancy defeating white water. Don't be caught in the rapids of air forced systems. Because we manufacture to suit the demands of healthcare professionals, we can easily design any RibbonFlo© to meet "your own" exacting requirements. With your imagination and our years of experience we will create an aquatic centrepiece that will be enjoyed by you and envied by others for years to come.